With the end of 2013 approaching, NAHB’s Eye on Housing would like to take a look at the updates that attracted the most readers over the last year. In July, we examined how survey data identifying upscale home features. A recent NAHB article reports on the top features for an upscale new home. The article is based on a statistical analysis of a long list of (approximately 120) features that home buyers rated on a consistent scale in the survey for What Home Buyers Really Want. The features spanned many aspects of the home, including windows, doors, kitchens, baths, specialty rooms, decorative features, accessibility, energy savings, and type of development in which it’s located. From this list, the statistical analysis grouped together a number of features that tended to be luxury or upscale items—which was evident from the nature of the items, as well as the way buyer preferences varied depending on the price they pay for their homes. For example, 42 percent of buyers expecting to pay at least $500,000 rated the top item on the list—a warming drawer in the kitchen—essential or desirable, compared to only 15 percent of buyers expecting to pay under $150,000. 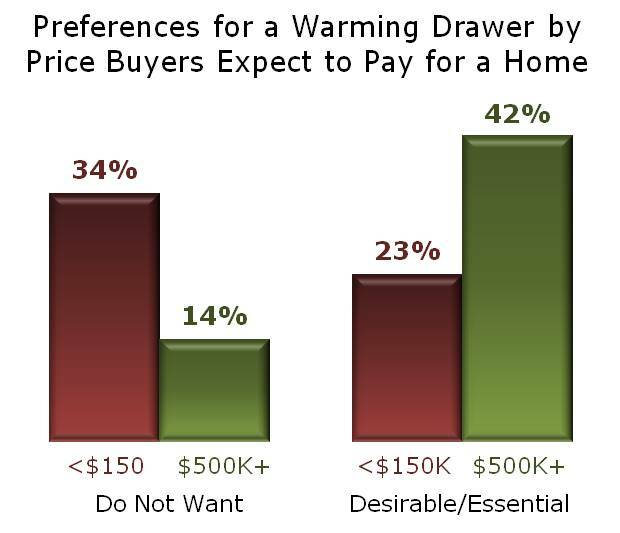 At the other end of the preference scale, only 14 percent of the $500,000-plus buyers say they do not want (are unlikely to buy a home with) a warming drawer. These are not features in strong demand by all home buyers, but luxury features usually appropriate in upscale homes, and usually inappropriate at the more affordable end of the price spectrum. See the full article for a discussion of each of these features and the methodology used to identify them.